After ThingOne and ThingTwo had had their bath tonight, Anne got ThingTwo ready for bed while I dried ThingOne and began to get her ready. Stephen: "Well, you're having your monkey pyjamas tonight ThingOne." L: "But I want my farm pyjamas I said!" S: "Well, what does Mick Jagger say?" L: "You can't always get what you want." S: "Yes he does. Well done. And he's right." We are attempting to teach ThingOne basic philosophy via pop songs. (She also knows that every step she takes I'll be watching her.) She now has Jagger's advice down pat, and yet tonight she wanted to delve deeper. Surely as a man in his thirties I could hold my own against a two year old. Surely. L: "Why I can't always get what I want?" S: "Because nobody gets everything they want. People get some things they want, but not everything." L: "But I want to always get what I want." S: "Well, in order to get that you'd have to only want things you CAN have." S: "So, for example, if you want pudding for breakfast, and breakfast for lunch, then you won't be able to get what you want, but if you want breakfast for breakfast and pudding at the end of lunch then you WILL get what you want, because that's what we ALWAYS have." L: "Why I can't have pudding for breakfast?" S: "Because pudding is for having at the end of lunch and dinner. For breakfast you can have toast or cereal. Or fruit." I felt we were going into specifics too much, but I was hoping she was taking the overall point even so. L: "I have yogurt for pudding. Why you have yoghurt for breakfast on Tuesday?" She had me there. She'd deliberately led me down this path, like a sneaky barrister. S: "Well, I had a train to catch so didn't have time to make breakfast. And anyway, yoghurt is special because it can be either pudding OR breakfast. Or a snack." I was floundering. Already I'd had to excuse yoghurt as a special case. I hadn't thought this through. L: "I want yoghurt for breakfast." S: "But then what would you have for pudding?" S: (Firmly) "Look, you're NOT having yoghurt for breakfast. For breakfast you can have toast or cereal." L: "Who sings You CAN Always Get What You Want." 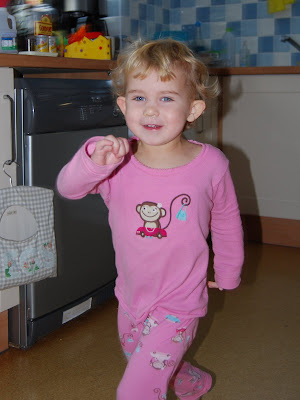 By this time she had her monkey pyjamas on. Thus I win. I think you resolutely lost that one, Stephen. Do you think so Kerry? I thought I'd satisfied my aims when I managed to get her into her pyjamas. Meaning I can get satisfaction. That is, to employ a double negative, I can't get no satisfaction. I give it 3 more weeks and before she defeats you on a regular basis. Wow, that's some seriously ruthless logic she's got there. Do let us know when she drives you to your 19th nervous breakdown.